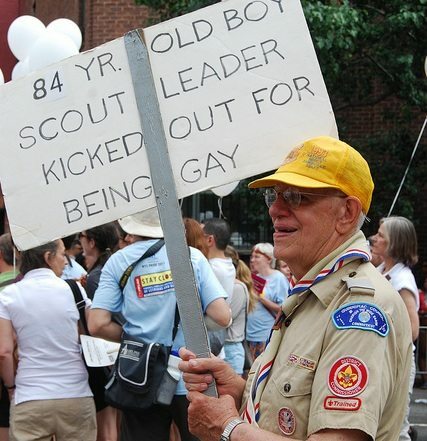 The Boy Scouts of America (BSA) is contemplating a change in its longstanding policy of prohibiting openly gay members. According to reports, formal action may be coming from the Scouts as early as next week. Is this a change of heart, a sudden awakening of a long suppressed sense of fairness? Or is it a reaction to its loss of big corporate donors after the BSA decided to publicly reaffirm its discrimination against gays? After the Scouts announced that it would uphold its ban against “open or avowed homosexuals” several months ago, a number of big donors decamped from the BSA jamboree, including Intel, UPS, Merck, and, even more importantly to the nonprofit sector writ large, the United Way. Intel had been the largest corporate foundation donor to the BSA in 2010, followed (in rank order) by Emerson, Verizon, 3M, Bank of America, Wells Fargo, Pfizer, Valero, UPS, U.S. Bank, Eli Lilly, GE, and Monsanto (note that corporations can make donations that don’t go through their corporate foundations, so the rank order could be different if total corporate giving were tabulated). Some of these corporations or their corporate foundations, such as Verizon’s, say that they do not provide funding for organizations that discriminate on the basis of sexual orientation, but that hasn’t stopped them from continuing their funding. Nonetheless, the pressure on these corporate funders to stop funding the anti-gay BSA could lead more to drop off. Verizon, for example, faces a petition on Change.org that has nearly reached the 75,000-signature mark.